Dusting Off, Cleaning Out, Taking Stock & Getting Ready for Gardening Season… Plus Another Giveaway! 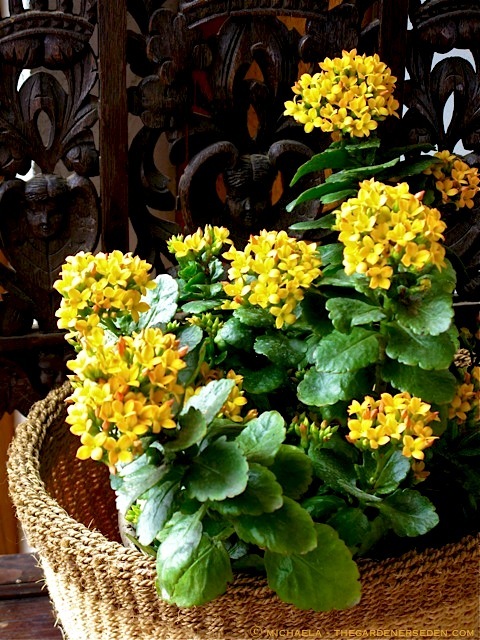 The bright gold of Kalanchoe blossfeldiana is a cheerful welcome in a chair beside my front door. I like using natural baskets as decorative covers for inexpensive, recycled plastic flower pots. I do a similar thing with plants placed outside in summer, using everything from wooden crates and baskets to tin cans and flea market finds to add color, texture and interest to plants with less-than-attractive interior containers. Ah, fog, mist, sunshine and April showers. What a mixed jumble the forecast is this week! My schedule seems to be at the mercy of the elements lately. But, undaunted by the moody weather, I’ve decided to take advantage of the unpredictable situation and use any rainy days or hours this week to sort through and give a spring cleaning to the growing collection of baskets and pots in my Secret Garden Room. Here’s Another Empty Vessel in the Walled Garden. I Love Contrasting a Smooth Surfaced Pot with Intricately Textured Foliage. 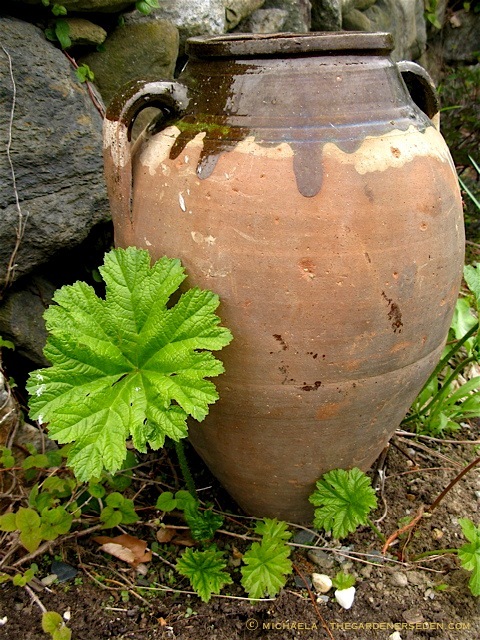 Here, Indian Rhubarb (Darmera peltata) Provides a Lacy Skirt on this Beautiful Piece of Pottery. Like many gardeners, I’ve recently become enamored with succulent container gardening. And why not? Succulents –and their close relatives, cacti– are so easy to care for. Last year, my studio’s steel balcony was filled with all sorts of dramatic pots (including the one pictured below), crammed with outlandish, colorful beauties and textural curiosities. Like ornamental grasses, succulents make great container plants for hot, dry spaces; think stone terraces, decks and windy balconies. Of course not all succulents are cold-climate hardy, so they must come inside if you live in a wintry region. But some cacti and succulents –including many sedum, sempervivum and others– are quite tough, and can be overwintered outdoors. Most of these fleshy, shallow-rooted plants are easy to propagate, and in cold climates, cuttings can be taken indoors before the frost in autumn and saved for next year’s container display. If you live in New England, I recommend signing up for Walker Farm’s free, succulent container gardening seminar on May 7th (click here for details). Daisy Unsicker, who will be leading the seminar with owner Karen Manix, propagates some incredible succulents at Walker Farm. Daisy creates gorgeous and inspirational succulent containers. Click here —or on the photo below— to see my previous post on “Un-Flower Pots”, for more unconventional, lower-maintenance, container gardening ideas. 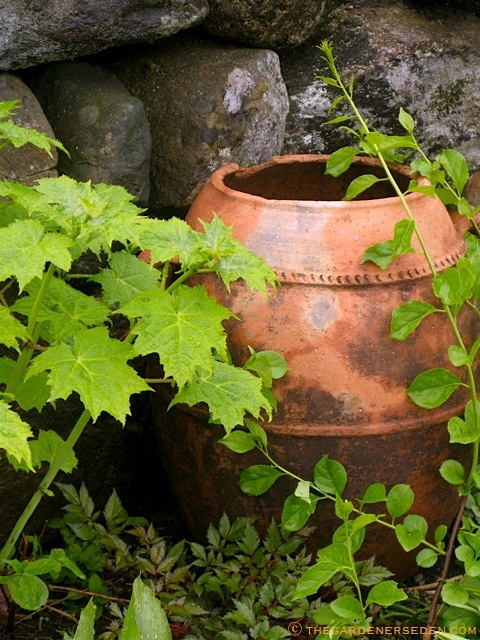 A few years back, The Jewel Box Garden, one of my now-favorite container gardening books by Thomas Hobbs (author of the also gorgeous garden book, Shocking Beauty), inspired me to look at unconventional ways to use pots and vessels in my landscape. 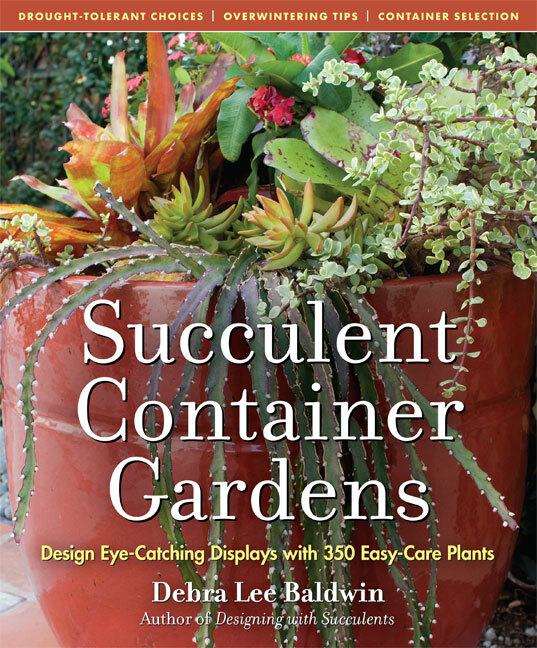 And more recently, I’ve found some fabulous ideas in Debra Lee Baldwin’s book Succulent Container Gardens from Timber Press. If you’ve been following this blog for awhile, you may remember that I’ve mentioned this title before; both here and over at Barnes & Noble’s now-archived Garden Variety. 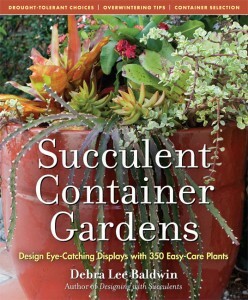 This is a fabulous book, and a real must-have for any cacti/succulent lover or container gardening enthusiast. Because I love this book so much, I’ve decided to purchase one to give away as part of this blog’s second anniversary celebration. 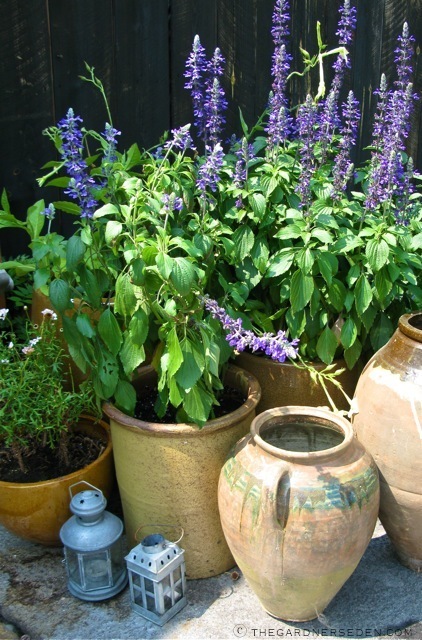 To enter, simply leave a comment on today’s post, and in your comment, tell me what you like to grow in containers: ornamental plants, vegetables/herbs, or both. Be sure to correctly enter your email address so that I can contact you if you win the giveaway (your email won’t be visible to others, nor will it be shared or sold). 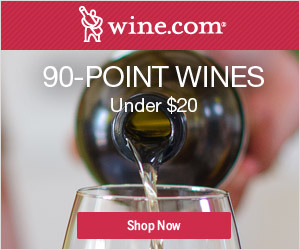 Your entry must be received by 11:59 pm Eastern Time, Friday, April 22nd. A winner will be randomly chosen from the entries received in comments, and announced 4/25 here, on this site’s Facebook page, and also on Twitter. Due to shipping restrictions, this giveaway is open to readers in the United States and Canada only. The Winner of Debra Lee Miller’s Succulent Container Gardens is Lisa N. Congratulations Lisa! Thank you to everyone for playing. If you didn’t win, please stay tuned for another chance this month! § 33 Responses to Dusting Off, Cleaning Out, Taking Stock & Getting Ready for Gardening Season… Plus Another Giveaway!" My favorite container right now is an old metal rooster I found at a flea market. I refreshed his paint, he has a sort basket as his body, so I lined that with mesh, and planted him full of hen and chicks. It looks great! Thank you for today’s blog on containers. I love container gardening. I just potted up some top hat blueberry bushes over the weekend! Hoping they will do well. I also have manyold pots picked up at flea market filled with succulents!They are so fun to mix and match. Every year I add a few more. Last year I grew radishes, tomatoes, green beans, cucumber, peppers and squash! Would really love to win the givaway! My favorite container is my neighbors old shallow metal basin that she used to bath her kids in when they were babies. I love to garden in pots since i am not a good weeder and i am a very good waterer and i love to pinch the tops off of annuals. I’m about to fill the container with pansies. Then i love to fill it with tall blue salvia and edge it with blue lobelia and then some pretty tall yellow fullness in the middle. Last year i realized i always do blue so i changed it up and boy did i miss the lobelia and the salvia. Always blue salvia since i really dislike the red salvia! Congradulations on your 2nd year anniversary of this fabulous blog. May it bring you much happiness and abundance! I love to fill in my courtyard with pots. Like you, I have a few empty ones, but I also have some that I put herbs in, a few with flowers, and two really big ones that I put tall palms in every year, along with a filler and a spiller! I love to container garden and am getting ready to do the pansies. I love lizyanthus!!! Last year I bought a flat of them. The lime green ones were my favorite. Great with purple Victoria Salvia….. So nice as a cut flower too. Wish it would warm up here so I could really have fun creating. Soon I hope. I have a number of large containers that I like to plant lettuces in, as well as basil, parsley, and hot pepper plants. One year I had 8 large containers on my deck – almost no room for people! This year I will once again plant herbs, lettuces, and peppers, as well as geraniums, dwarf sunflowers, and vinca. My basil, chives, and parsley are sitting in my bay window, patiently awaiting transplant time! i grow strawberries in containers, because they are easier to feed and protect from mice and birds! also pots of rosemary and one major bay tree. i have a lot of big houseplants too, which go into the garden in summer. i have recently bought and moved into my first home. the first project that i did was to paint a floor brightly colored and line it with plant pots that i love down a south facing window. i am currently loving growing succulents, like you, but also herbs and things with lovely foliage. i saw at a coffee shop in san francisco all sorts of creative containers for succulents–coffee pots and carafes, etc. lovelovelove. the website seriously does not do them justice. they also come in warm tones and yellow and all different sizes and are just the bee’s knees. I love to plant impatiens in containers by my front door. The hummingbirds love it! My favorite Terra cotta potter was filled with succulents when it bit the dust this winter! Fortunately, I was able to move them on over to a beautiful, footed, verdigris planter I inherited when I bought my new home. Hopefully, my sweet hen-and-chicks will survive the move! I wish I had a Secret Garden Room! I do have a Secret Vase Closet though. My collection of pots is rather standard, but I do have a lot. I change their arrangement every year and base the design of the grouping on whatever catches my eye over the course of mid-April to mid-May. Some years the palette is quiet and sometimes it’s a riot of color. Why someone would plant the “same old” every spring mystifies me! I’ve only done inside plants in containers. I have not tried container gardening during the garden season outside although I have wanted to give it try for some time. 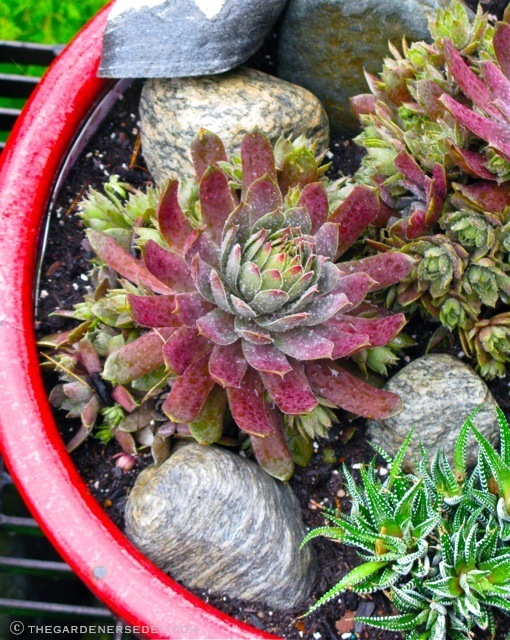 The succulents look so lovely in the containers with rocks alongside the plants. I also love the look of many pots arranged together with varying types of the foliage and flowers. So eclectic, textured and pretty! I have a fondness for vintage baskets , especially those of Asian origin : either traditional woven willow in a rice pattern or split bamboo , as well as wooden rice and water carriers. Coincidentally , I plant succulents, mosses and other ground covers in these , miniature little landscapes if you will with paths of gravel and sometimes accents of seashells which work great with succulent and cacti forms . These containers are easy to find on EBAY and at a great price . I just planted some boxes with Hens and Chickens and a couple other succulents. I hope they’ll do well in their new home! I’m just now learning a bit about using them. My mother-in-law was an amazing gardener and had containers of every shape and size filled with succulents. In the next couple weeks we’ll be clearing out the family home and I hope to save plants from her yard to share with all of the grandkids and to put in my yard. It will be special to have pass- along growing plants from such a wonderful woman! I must confess, I have never had much luck with keeping plants alive in containers or pots. Maybe it’s due to soil or watering issues…..I am much better with plants in the ground. I guess I need a tutorial! Hi Michaela! Here in central Florida, most things go right into the ground, but my husband has a collection of orchids which grow in pots, and we also have numerous large potted plants scattered around the pool deck for color and interest. I love trailing flowers in hanging baskets on my front porch (my favorite way to grow in containers). I haven’t tried any succulents yet, but I’m inspired now. What do I like to grow in containers? Everything! I live in an apartment, so if I want plants, and do I ever, I have to grow them in some kind of container. For years, that consisted of mainly houseplants: ivy, diffenbachia, peace lily, rubber tree, eventually some succulents. During the summer I had geraniums and marigolds and whatever else could live on my perpetually shady balcony. Then five years ago I moved to a different apartment, with a huge south-facing balcony, full sun, and could finally start growing FOOD! So now it’s tomatoes, squash, beans, broccoli, carrots, lettuce, spinach, and all kinds of herbs: chives, winter & summer savory, rosemary, tarragon, sage, oregano, thyme, parsley, cilantro, and of course tons of basil. Of course the inside is still stuffed with plants, and half of them now are succulents. Always have hanging planters with flowers or greenery to brighten the front porch. Trying to do container gardening on the deck this year. Want a few tomatoes, flowers and herbs close to the kitchen, instead of up in the greenhouse. Some days I think I should chase the sun with my pots; other days I think que sera sera. I have an dilapidated well bucket placed beneath an old hand pump… planted with cherry tomatoes and thyme — don’t know if it will work, but giving it a try. Plants in pots was never for me until my husbands fascination with succulents finally rubbed off. He is always drawn to succulents (when dragged to yet another public garden) and always asked why I didn’t plant more in our garden. So I finally gave them a try indoors in an old copper bowl-WOW. Poor soil, little water, easy to propagate and outrageous shapes. I’m hooked. I’m just starting to explore the possibilities. This will be the first summer I try them outside in a big cement urn in a hot dry spot near the driveway. I thought I would tuck a few stone birds in the pot as well, sort of a mini forest. Usually, I favor growing strawberries in containers to keep the slugs away, but this year I’ve embarked on a water garden in a half-barrel. Currently enjoying water lilies, iris, parrot feather and water hyacinth. They’re all scrawny right now, but hopefully will lush out and bloom later. My containers are usually filled with perennials and herbs. I enjoy gathering second-hand and cheap clay/ceramic pots and filling/adding each spring. I need to step it up a bit this year, and I was just looking at some hens and chickens in a friend’s garden. Succulents is one area I’d really like to learn more about. Our Master Gardeners Fair is in a couple weeks and the best tomato plants will be there – only $1 each – SunGold’s – the best cherry tom. But, those go in the ground. Hoping for an aphid free summer! I live in an apartment, so I like to grow smaller things like herbs, forget-me-nots, maybe a geranium. But I am wanting to expand my horizons in this regard, so the book would be lovely! Thank you. Great for herbs and nasturtiums. I pot up lots of spring bulbs in containers, especially tulips, and then sprinkle leaf lettuce seeds around the base to create ruffled “knickers”. The red leaf varieties look the best. Thank you again. Winning really made my day (both when I got your email and again when the book arrived). There is so much uncertainty and bad news out there; a little good karma treat goes a long way! I wish you many sunny days, cool nights, gentle rains and a lot of success with your endeavors. I hope you will continue to share your thoughts with all of us on your blog. Hi Lisa, I’m so glad to hear that you are happy with the book! Thank you for your sweet comments and encouragement. Hi, Michaela — What a delightful surprise to run across this post, to learn that you liked my book so much that you bought one to give away (gee, Timber Press probably would have sent you one), AND to read winner Lisa’s sweet comment. Made my day! Hello Debra, And what a surprise to find your comment! I really enjoy your books —clearly we all do!— and look forward to checking out your website (how did I miss that?) ;) Thanks for stopping by. (PS Yes, somehow I need to get in the loop on Timber/Storey book reviews and giveaways. I know readers love both!). You are currently reading Dusting Off, Cleaning Out, Taking Stock & Getting Ready for Gardening Season… Plus Another Giveaway! at The Gardener's Eden.